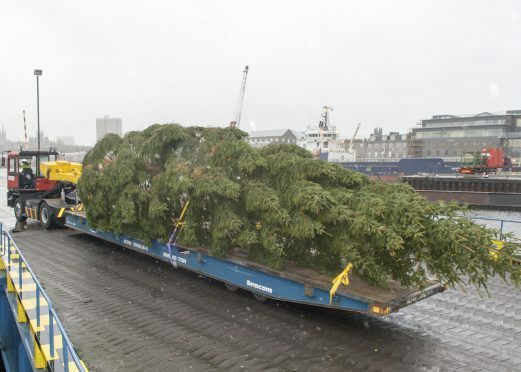 Aberdeen’s Christmas tree arrived in the Granite City’s yesterday at the end of its 312-mile journey across the North Sea from Norway. The gift from the people of Stavanger has been a fixture in the north-east’s winter festivities calendar since 2005. It had been feared last year’s tree would be the last sent from the Scandanavian city for up to 20 years after it ran out of suitable spruces. However, a worthy tree was found and felled – allowing the beloved convention to continue. This year’s 35ft Norwegian spruce arrived yesterday morning aboard the 6,693-tonne SeaCargo Express, and was then lifted on to a flat bed lorry. It will be another week before it is put up, to give experts from the Forestry Commission and the city council’s arboricultural team time to examine it for any dangerous insects or diseases which could potentially harm Scottish plant or animal life. The spruce will remain in quarantine at Aberdeen harbour before it takes pride of place at the Castlegate on Monday. Once its festive decorations have been added, Aberdeen Lord Provost George Adam, will lead a lighting-up ceremony on Thursday, November 26 at 7pm. Joining Mr Adam at the switching-on ceremony will be Bjorg Tysdal Moe, the deputy mayor of Stavanger, for what will be the 25th year of the two cities’ twinning. The event will be one of the first of many making up this year’s Winter Festival across the city, with the Christmas Village opening in Union Terrace on the same day, as well as Marischal College being lit-up with a festive light display. And on November 29 youngsters and families will be able to see the Trinity Centre reindeer parade followed by the switching on of Union Street’s Christmas lights, with this year’s theme being the 12 days of Christmas.